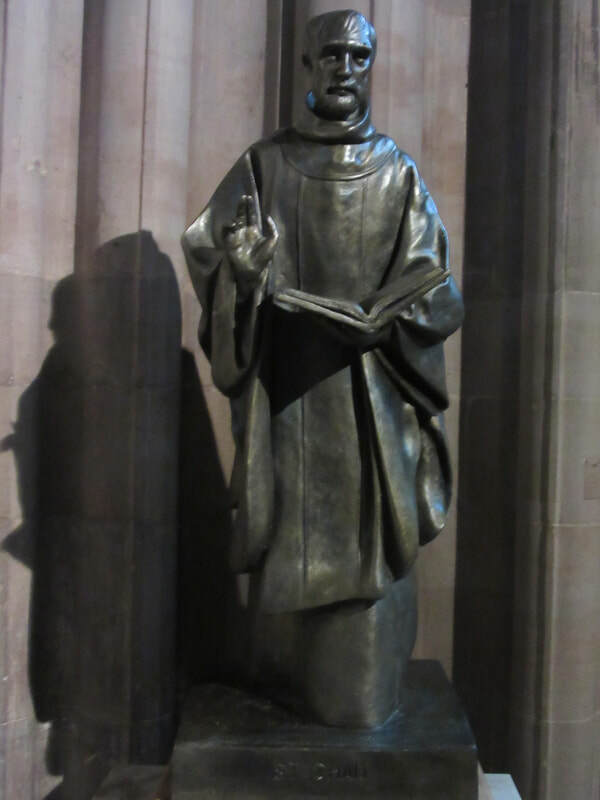 Most of what we know of St Chad comes from the writings of Bede who had a very high regard for him and gathered his information from those who knew Chad personally. It seems most likely that Chad was born around 634 into a family of Northumbrian nobility suggesting an Anglo-Saxon background. However his name which means ‘battle’ was popular in Wales and so it is possible he had a mixed ethnic background. He was one of four brothers, the others being Cedd, Cynibil and Caelin. It seems most likely that he was the youngest of the four. As a young man he had his early training under St Aidan on the holy island of Lindisfarne. In 665 the pro-Roman St Wilfrid was expected to become Bishop of York but he left the country to seek a valid ordination in France as some considered ordinations in Britain to be invalid. In his absence King Oswiu of Northumbria became impatient for some religious guidance in his kingdom and decided to send Chad to Kent to be ordained Bishop of the Northern Church at York and this duly took place. Chad took to his new task with characteristic zeal and was well known for refusing to ride on horseback, preferring to walk in order to more easily engage with people as he preached the gospel in the towns and countryside. When St Wilfred returned in 666 he was displeased and opposed St Chad’s ordination. Three years later a new Archbishop of Canterbury Theodore of Tarsus was appointed and he soon charged Chad with holding his office illegally. Chad quickly replied that if this were the case he was very happy to resign as he had only taken up the bishopric out of a sense of duty and never thought himself worthy of the position. Theodore was so moved by Chad’s humility that he promptly completed Chad’s ordination in the Roman manner, but Chad preferred to resign and retired to Lastingham. However soon after need arose for a new Bishop of Mercia and Theodore asked Chad to take on the responsibility which he did in 669. Historically there had been much hostility between Mercia and Northumbria and it would have been a challenge for Chad as a Northumbrian to take this position in Mercia. However, although he was only in office for three years, his ministry appears to have been highly effective. His humility and godliness were well known and he brought many to the faith. He is reputed to have baptised them in the well now called St Chad’s Well by St Chad’s church in Lichfield. Legend also reports that he spent long hours standing in the well in prayer! Chad died on 2nd March 672 and was buried in the Church of St Mary. He was immediately venerated as a saint and his relics were soon taken to the Cathedral Church of St Peter. Cures were claimed in both churches. Bede described his first shrine as ‘a wooden coffin in the shape of a little house with an aperture in the side through which the devout can…take out some of the dust, which they put into water and give to sick cattle or men to drink, upon which they are presently eased of their infirmity and restored to health’. His relics were translated in 1148 and were moved in the early years of the fourteenth century to a splendid marble shrine adorned with gold and precious stones. The shrine, which was originally made in Paris, was provided by Bishop Walter Langton. By 1378, the shrine was housed near the new Lady Chapel. At the time of the Reformation the bishop of Lichfield pleaded with Henry VIII to spare the shrine. This was done, but only for a short time. At some unknown date the head and some other bones were separated from the main shrine. Some of these bones were hidden over the centuries by Catholic families in Staffordshire and were found at Aston Hall which is on the Two Saints Way. They are now in the Roman Catholic cathedral of Birmingham. The origin of the distinctive St Chad’s cross come from a so called carpet page in an 8th century Mercian illuminated Gospel Book called the Gospels of St Chad. It is thought that this gospel was associated with the shrine of St Chad in the same way that the Lindisfarne Gospels were associated with the shrine of St Cuthbert. The Gospels of St Chad are in Lichfield Cathedral Library. There are 33 ancient churches and several wells dedicated to St Chad, mainly in the Midlands, as well as several modern dedications.